There are many styles of Barbecue Sauce and these 10 Best Sauce Recipes are taken from our travels all over the US. Memphis, Carolina, Kansas, Texas, Chicago, California and more. Because we want you to have the best we've included 4 Bonus Recipes to help you make the best of every Barbecue opportunity. Overall you receive 14 recipes for the price of 10. Get this eBook pick your style and create your own spin on world class BBQ sauce. Over the years the hunt for the perfect barbeque sauce has been as storied as the search for the monster of the blue lagoon. It seems every corner of the United States is famous for producing some sort of barbeque sauce and why not, the term barbeque sauce, and barbecue sauce are the highest searched terms in the world of barbecue. The term is so valued that companies who run Pay Per Click campaigns during the month of June through September pay up to $4.00 and beyond for a click just to be listed on the front page of Google’s barbecue sauce page. Because we believe that everyone should have freedom of choice we have collected 10 of the most popular and easiest to make bbq sauce recipes . 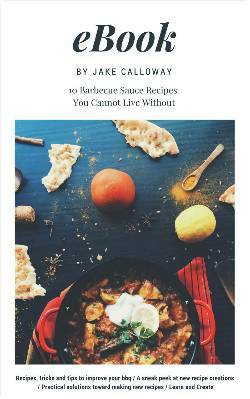 We have not set out to put long stories or discussions of wet versus dry barbecue sauce in this eBook. Instead what we’ve done is collect 10 of the best BBQ Sauce Recipes we’ve ever used. And because you’re so nice…we’ve added in some Bonus recipes that can be made with typical everyday kitchen ingredients. So, next time you decide to barbecue peel this recipe list open and give yourself a shot at one of the options. One thing we will tell you is that each of these recipes is taken directly from sources in the region. We at Jake’s make all natural products so some of the ingredients like Ketchup and Corn Syrup you’ll never seen built into our recipes. In addition we don't use MSG in our award winning recipes. We know that some folks actually ask for more MSG when ordering Chinese Food but for a vast amount of my customers and myself included we just can't stomach MSG. In fact using it 100% guarantees that within and hour I'll have a headache. So, nix on the MSG and plus on making our sauces with the finest ingredients we can find. Note, some of the recipes in this collection have been given to us by the BBQ masters and generations chefs and are their direct recipes. So you can expect the use of some local favorite items. A style which doesn't get much air time but is considered a favorite is Chicago. And you say..."Chicago?" yes, Chicago. The Chicago style of BBQ Sauce is a conglomeration of styles eastern, western, and some southern US. We've taken the liberty of presenting one of those Chicago recipes for your review. Give this recipe a spin and see what you and your folks think. For more great and unique recipes just like this one get our eBook 10 Barbecue Sauce Recipes You Can't Live Without. Who can forget the flavors of Old Chicago. Subtle and bold all at the same time. Blend BBQ sauce ingredients together and let rest for an hour. After resting baste or marinate your favorite meats.